Sara Ali Khan was spotted at the wrap-up party of Kedarnath along with co-star Sushant Singh Rajput and others. The starlet looked absolutely gorgeous in a satin yellow knotted ruffle top by designer duo Abu Jani and Sandeep Khosla. Sara Ali Khan might be yet to debut on the big screen but her public appearances have already established her as a fashionista to look out for. Amrita Singh and Saif Ali Khan’s daughter who is all set to debut with Kedarnath in her latest outing continued her love affair with denims and gave us some major fashion goals. Sara was spotted at the wrap-up party of the film along with co-star Sushant Singh Rajput and others and the starlet looked absolutely gorgeous in a satin yellow knotted ruffle top by designer duo Abu Jani and Sandeep Khosla. The voluminous sleeves added an element of drama to it and she paired her top with a pair of ripped jeans. With hair in soft waves, she rounded out the look with colourful stilettos. The knotted top makes her seem like someone straight out of the early ’90s glamour world and we cannot take our eyes off her. Posing for the shutterbugs, she looked lovely and gave a lesson or two on how to dress up for an evening event without much fuss. This is reminiscent of the time she had shown us how to effortlessly glam up denims. Sara was spotted having dinner with her friends in a Mumbai restaurant and was seen sporting a lovely pink satin blouse. We had loved the knotted top and the cinched sleeves. 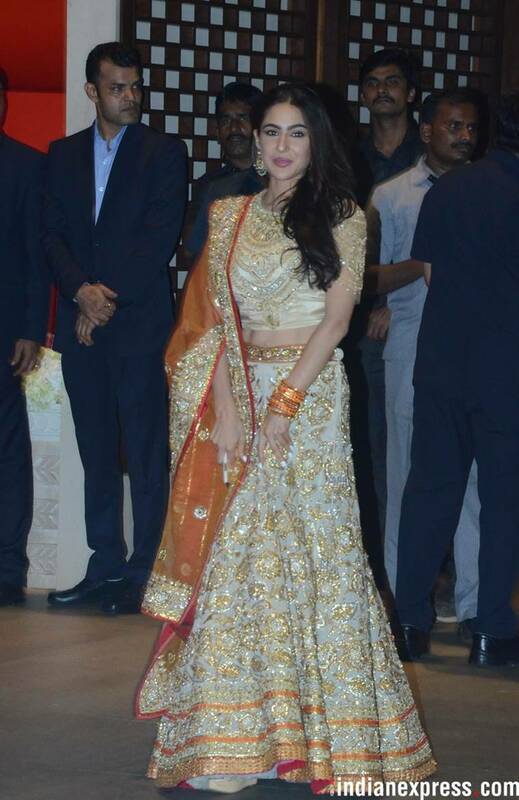 Prior to her wrap-up party, Khan was seen at the star-studded Akash Ambani and Shloka Mehta’s engagement, wherein she wore a cream-orange lehenga by designer duo Abu Jani and Sandeep Khosla and looked striking.